Below is the text of the announcement for the 1942 spelling reform that I first wrote about in February. 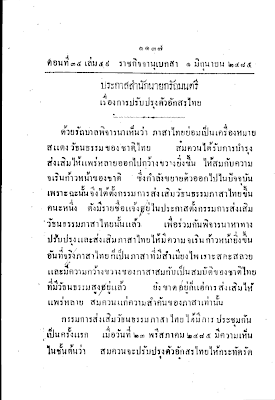 "Prime minister's office announcement on improving the Thai script" is dated May 29, 1942, and was published in the Royal Gazette on June 1, 1942. It outlines the new spelling rules, and bears the name of Field Marshal Plaek Phibunsongkhram. You can see the scan of the original document in PDF format on the Royal Gazette website. The first page of the announcement. I'll post a translation another time. For now, I've color-coded the text, because I think it makes for an interesting way of visually absorbing the announcement all at once. Once again I've been inspired by the good folks over at babelhut.com. 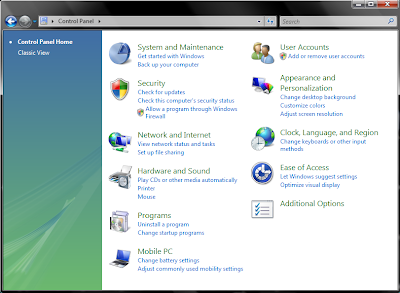 There's a very nice post by Peter on setting up your Windows Vista computer to type in Spanish. With apologies to Peter for inevitable similarities, here is my post for Thai. I figure those searching Google for help will likely specify the language they're looking to set up, so I believe a separate post for Thai is justified. One of the nice things about a modern computer system is that you don't need any special software to type in Thai. This applies to Mac, Windows XP, and Windows Vista. I can't tell you about Linux--anyone in the know care to chime in with a comment? 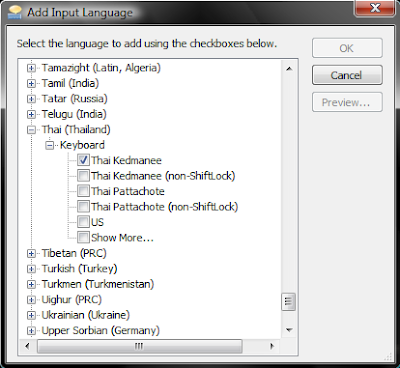 Your computer comes with the functionality to type Thai, or nearly any language, buit-in. You just need to change a couple of settings to allow you to switch between languages on your keyboard. 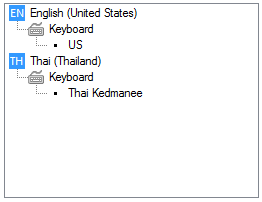 By far the most common Thai keyboard layout is Kedmanee. 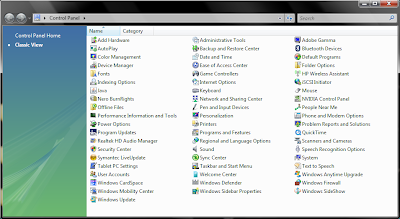 Every internet cafe you'll ever go to will have this layout. If you've learned to type in Thai, you probably learned the Kedmanee keyboard. Pattachote was designed in the 1960s to be more efficient, but it never caught on (there's a great article about its history and merits). Kind of like with English, where the QWERTY keyboard was designed in the 1860s supposedly to make you type slower, but we nearly all still use it 150 years later. 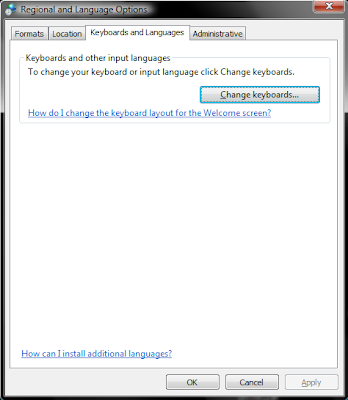 Once you've checked the box for the keyboard layout(s) you want, click OK and you'll be back in the Text Services and Input Languages window. 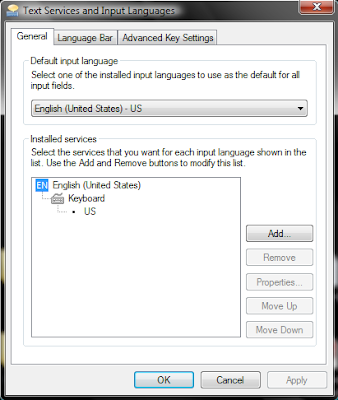 Click over to the Advanced Key Settings tab to configure how you want to switch between input languages. Click the radio button for Grave Accent (`) on the left hand side under Switch Input Language. You don't need to mess with Switch Keyboard Layout, unless you have more than one keyboard layout installed for a single language (like if you chose to install both Kedmanee and Pattachote). 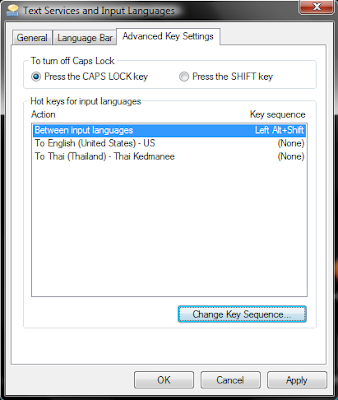 Now the ` key will toggle between the two languages. If you use more than two input languages, you can also set up a shortcut to switch directly to a given language, but if you're only using two or three, it's just as easy to just toggle between them. And that's pretty much all there is to it. The process is similar for other languages, and nearly identical in Windows XP (I just happen to be running Vista at home). 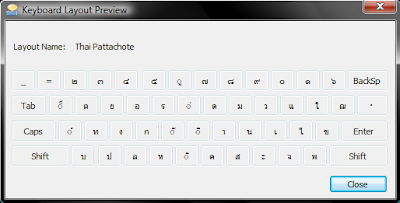 Oh, and if you need help learning to type Thai, try Thai Typing Tutor. It's free. It's what I used. Nowadays, I touch type on my laptop's regular English keyboard (no stickers). I recommend learning, because once you do you can type Thai on any keyboard, even if the stickers fall off and the symbols wear away. This falls under the category of 'things I've known about forever and consistently forgotten to blog about': FSI-Language-Courses.com. 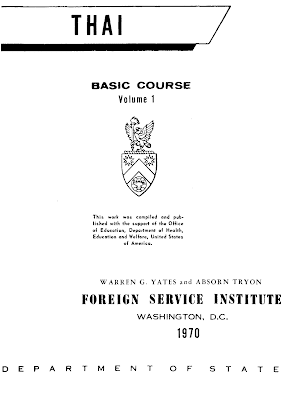 If you're not familiar with it, FSI is the Foreign Service Institute, the U.S. government's training center for foreign service officers—diplomats and the like. It was established 60 years ago to replace an earlier incarnation established in 1924. The Institute has developed language courses in a large number of languages. And as a government body, all of its work is in the public domain and freely distributable. FSI Language Courses was started by Glen D. Fellows in 2006. Users on the site (including Glen) scan FSI coursebooks and record FSI audio tapes that they either buy (they're regularly sold by third parties at exorbitant prices) or check out from a library. The resulting pdf and mp3 files are then made available for everyone. No copyright. No cost. Simple. Brilliant. The site has FSI course materials for 34 languages at the moment, including Thai, Lao and Cambodian. Granted, these courses are at the youngest a few decades old, but you can't beat the price. Among the other languages you'll find materials for are Mandarin (listed as "Chinese"), Cantonese, Korean, Hindi, Swahili, Arabic, and a couple dozen more. Should keep any polyglot busy for years, really. And if your eyes are rolling back in your head at the thought of right-click downloading all those files, then try DownThemAll, one of my favorite Firefox plug-ins. Just play nice and don't download everything at once. *There is a typo in the URL for Tape 39 of Reading Lao, but you can manually correct it: change 396A to 096A in the filename. I've been in the U.S. for a month with my family. If you're clever enough to find my family blog, you can read about it (I'm making it marginally more difficult by not linking you in order to deter lazy stalkers). You'd think I'd have more time to post here, but that's not how it's turned out. But I'd like to share an idea of mine with readers here. So what's it for? It's a place to collaboratively transcribe Thai videos found on sites like YouTube and kosanathai.com. Maybe that description underwhelms you. So allow me to start at the beginning of my thought process. In the last year or so, an incredible number of Thai-language videos have cropped up on YouTube (commercials, movie trailers, music videos, TV show clips, even full TV episodes and full movies). I'm sure this increase is in part due to the Great YouTube Drought of Ought-Seven (you know, due to the Streisand Effect and all). Nowadays, you can watch any of Thailand's big network TV shows within hours of their live airing (super-serialized into YouTube-size chunks). As a second-language speaker, fast colloquial speech in videos is some of the hardest to understand. Scripted dialogue in sitcoms, talk show banter, and off-the-cuff wordplay on variety shows are different from speaking with acquaintances live and in person, who we know and who know we may not always catch every word. And you can't stop the flow to ask about a certain word or phrase. I often rewatch a clip several times, trying to catch the parts that go over my head. Sometimes I figure it out, sometimes I don't. So the idea is simple: create a site where anyone (that includes you) can help transcribe the video clips that are already out there. You type out the parts you know, and other people help fill in the gaps. If you can't type in Thai yet, or aren't up to the task of transcribing, you can still benefit from the work that others do. It's a wiki, so it's easy to edit and open to everyone. It's a way to take video clips aimed essentially at native speakers, and add value to them for language learners. You can help even if you don't know Thai, for that matter. You can create new pages for videos you'd like transcribed, which you can then copy-and-paste into websites like thai2english.com to help make at least some sense of the content. This brings me to another feature which several people suggested: collaborative translation. I think this is a natural extension of my idea, but I'm concerned it would be like trying to run before walking. But that's the great thing. It's a collaborative site, so anyone is welcome to try what they want. Transcription of the English word 'autistic'. Thai film director and producer Prachya Pinkaew is known for such films as Ong-Bak and Tom-Yum-Goong. /trut ciin/, the Thai word for Chinese New Year. This is the release date for the movie (February 7, 2008). Get the idea? I've played around with different notations to indicate various things. Personal names in green, difficult or unusual words in red. I also toyed with italics for words shown onscreen (as opposed to spoken words)--this is a common issue for movie trailers), but I think it's kind of distracting. I'm not married to any of it, and I'm sure there are better ways of doing things that I haven't thought of. They don't have to be my ideas or my standards. Rather, whatever the community comes up with and decides works the best is what we'll use. As I've said, this is just my sandbox version of my idea, but I'd like to invite everyone to come play around with it, too. Please, make new pages. Start transcribing, if you're so inclined. I registered a domain name that I plan to eventually move this blog to. And I'll make a subdomain of that domain for the Thai Video Transcripts wiki, using Wikimedia software, which will allow me to better customize the features of the wiki (like hypertext footnotes, a la Wikipedia). Whatever is done in the sandbox site will be moved to the final site when the time comes. I've also been looking at other Wikimedia plug-ins that would let me do some pretty cool things. For example, if I'm reading their website correctly, Kaltura can overlay dynamic subtitles on flash videos, which would mean being able to turn a static transcript into live subtitles, which would be awesome (but I think that would require actually hosting the videos myself, instead of piggybacking on YouTube). Another problem for another day. A few words about what I don't plan for this site to do: create videos. The whole point is to bring something to life as simply as possible that is self-sustaining and community based, built around a motivated group of Thai-language students (and, if we're lucky, some native speakers) who can collaborate to create a great learning resource for themselves and others. So there you have it. My big idea (or, one of them). I think it's got a lot of potential. I'd be much obliged to receive any comments and suggestions you all may have.